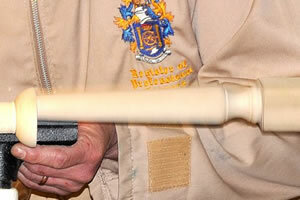 you during this weather come along to John Berkeley’s demonstration. Sunday and Monday. May I take this opportunity to thank those of you who, over the past year, have produced and donated the items for our charity venues. 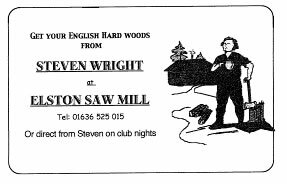 A handful of us attended Steve’s sawmill the other Saturday. 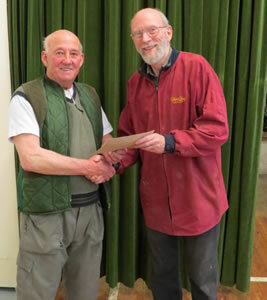 Steve had invited Peter Tree, a local chair maker, to also entertain and enlighten us. Steve, as ever, was at his best explaining how he selects the wood, transports it and prepares it for sale. Thanks for your hospitality, Steve. to prevent any internet connection, causing me to copy all files, then look elsewhere for sending to you all. I am eagerly awaiting its repair. Finally, thanks to those who have contributed articles to this edition. Please consider offering to add your little bit to any future publication. Continue turning safely. This will be the last hands on prior to us attending Moorgreen Show in August. 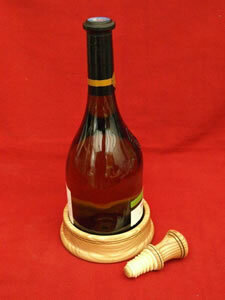 Pat would like us to consider making wine bottle coasters or stands, and suggests we bring along a blank of wood 120 to 130mm diameter and between 25 to 40mm thick. Please also bring along your own gouges, etc. The opportunity to sharpen will be given during the evening. Pat has suggested the coaster to look like…. 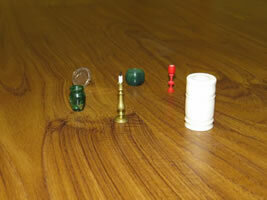 The making of a matching bottle stopper can be considered. This was a first for Paul at our club. He explained that he accepted a bursary, 2 years ago, from the Worshipful Company of Turners. 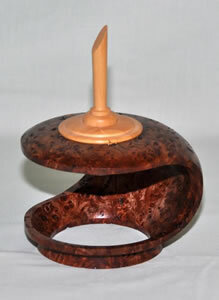 Paul’s first item was to produce a cabriole leg suitable for a stool or low table. The piece was cut on the bandsaw earlier and placed between centres. The centres each end being the centre of the smaller cross section. 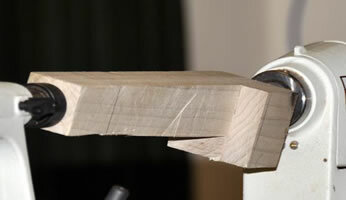 the piece was placed between the centres of the original square section, to shape the foot. 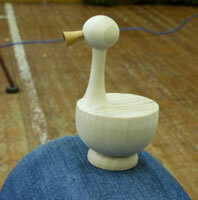 Next Paul produced an off-centre duck by first roughing to round between centres. 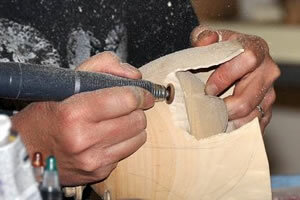 Shaping the base of the duck with a 32mm spigot on the bottom – to be fitted into an off- centre jam chuck, with the tail stock brought up for support. The 32mm off-centre hole in the jam chuck was 15mm off-centre. The neck and head of the duck shaped. Finally fitting a shaped beak. Paul’s final piece was a mushroom. 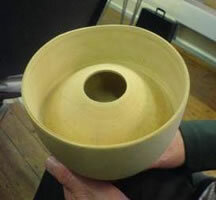 He explained that his preferred shape is a slight ‘ogee’ on the top and a bulbous vase shape for the base. David Francis Competition – Wed. 8th May. 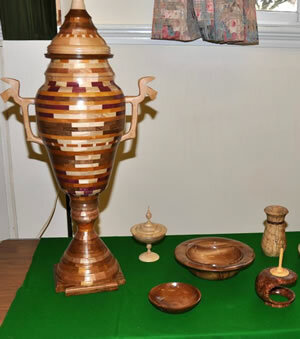 We had 20 entries from 13 entrants, which is consistent with the past few years. 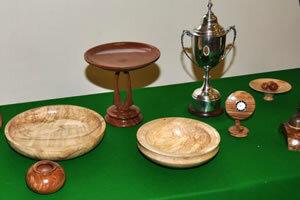 The competition, as previous, was an open competition, and a good variety of bowls, vessels and open forms were entered. 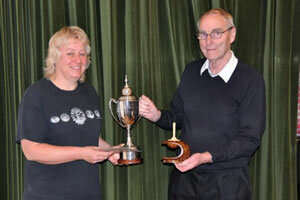 Congratulations to the three prize winners. 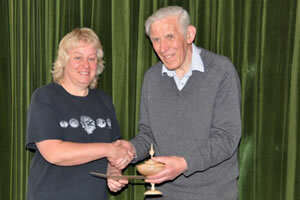 The trophy winner was Alex Baxter for his burr box. 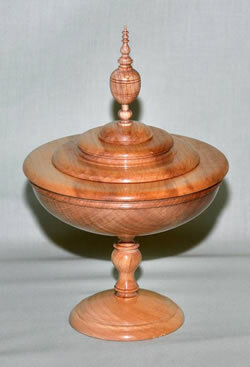 The runners up were Brian Thornton for his pedestal box. 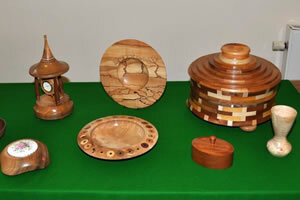 And Mick Webster with his platter of cross-section inserts from various variety of woods. Thanks to you all who took part. Was hosted by Vic Milner. Vic brought along a large number of corks for us all to make bottle stoppers. Vic also donated a piece of olive root which was given to the winner of a wood identification quiz made by Vic. A really good turnout for a memorable evening. Joey shared with us how she developed her skills and style and gave us many tips and guidance for our own development. A strong message that she repeated was to not be frightened of applying for bursaries to help further your interests. This is particularly important for the younger turners who should always be encouraged. 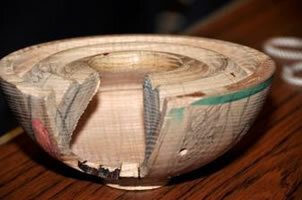 Anyone wanting help with this should e-mail Joey joeyjoey@btinternet.com who will assist with bursaries from the Guild of Woodturners. Joey started with a bursary that enabled her to travel to America and obtain guidance from Binh Pho who acted as her mentor and had a big influence on the ideas that she is now well known for. Joey has no formal art training but has developed her style by starting with a simple idea and then gradually adding to it in small stages (very good advice for all of us). 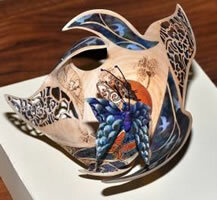 She now tries to incorporate a story into her work based on recent experience or observations. I think this is an excellent strategy particularly for those of us that often do not know where to start when developing an artistic design. 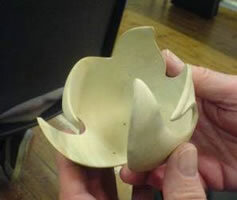 The basic shape that forms much of her work is a sphere, but who would know how to create a spherical shape that has leaves folding into the sphere. Joey set out to demonstrate the technique. 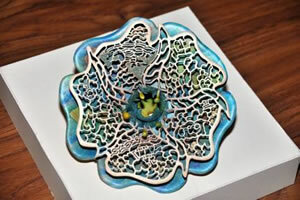 The forms created are pierced with intricate designs; techniques for doing this were also demonstrated. Obtain a suitable pattern often from pattern books. Photocopy the design using a laser printer or photocopier, not an inkjet printer. Place the photocopy face down onto the wood and tape in place. Using cellulose thinners (nail polish remover will also work) brush a small amount over the design and rub on with the edge of a credit card or something similar. 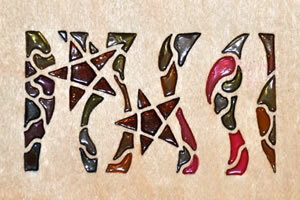 Peel off the paper and the design will be left on the wood. 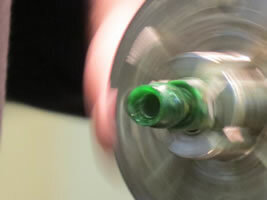 Best tools are high speed air tools, a bit like a dentist drill running at 360,000rpm. 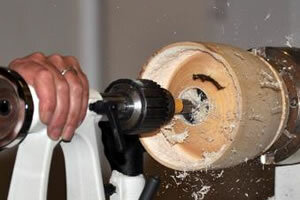 For comparison, a Dremel usually runs about 40,000rpm, this can be used but does not produce such good results. These tools produce very fine dust so always wear protection. Always start at a corner not along a line, very difficult to join up on a line. 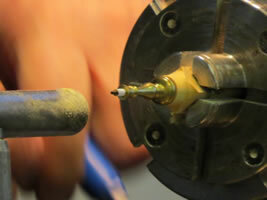 Cut clockwise and cut with the tip of the tool, keeping it perpendicular to the wood. When piercing or removing waste keep your body still just move the wrist or the wood. Clean the work with a bristle brush. 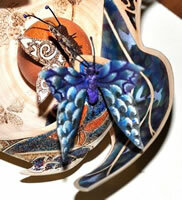 Joey showed the use of 3D Crystal colour lacquer pens to fill in piercing to form a stained glass effect. 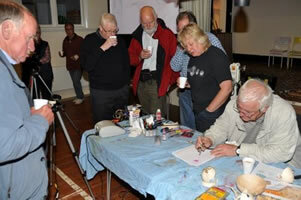 Joey demonstrated the Iwata hi line series air brush. She showed various techniques of using the air brush and how to blend colours. Important to keep the air brush clean. Can use 40% window cleaner 60% water for cleaning. 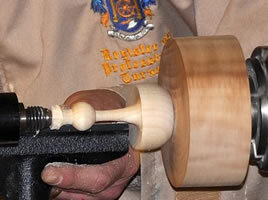 Prepare the surface of the wood sand to no finer than 320grit. Demonstration on turning the first stage of creating folding leaves effect. 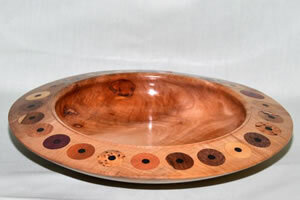 Usually uses wet Sycamore for its close grain and light colouring. 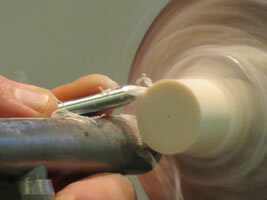 To maintain the light colour freeze the blank before turning. 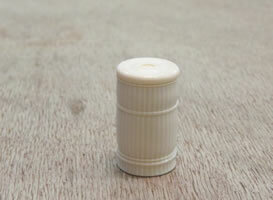 Alternatively you can use Rustin bleach and then white vinegar to neutralise it. 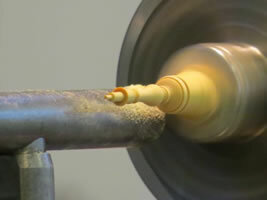 Turn two or three rims into the end grain and shape the rims as if they are the top parts of reducing diameter spheres. 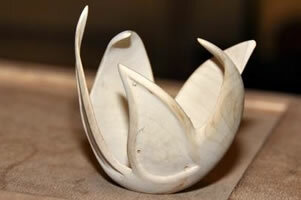 Create the leaves by carving into one of the rims. Finish the leaves by chamfering the edges. 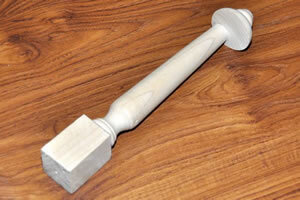 John’s idea for the evening was to make Mortar and Pestles for our ‘charity box’. A variety of shapes were formed during the evening, and a respectable number of them were completed. I’ve never been so grateful for our large screen demo filming as I was for John Berkeley’s demo on July 10: we wouldn’t have seen much without it as his theme was “miniatures”: a candlestick in boxwood about an inch high, a beautiful threaded pill box in alternative ivory, a goblet good luck charm, 5mm wide (“always overflowing”) with a captive ring (“for eternity”), a tiny vase, and a jardinière in cast polyester. 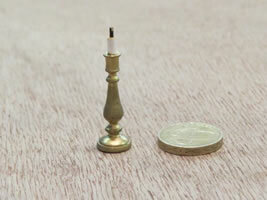 Apparently such tiny turnings can be very remunerative as the “dolls’ house fraternity” will pay good money for 1/12 size items. 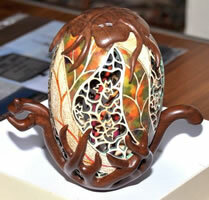 Generously John donated his creations to our charity. 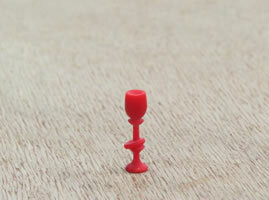 John uses unconventional tools and methods to achieve his miniatures, doing much of the turning with a ¼” point tool, supported with an arm rest. 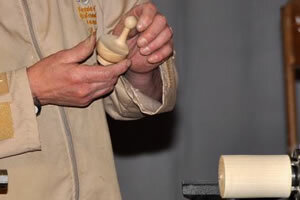 He uses a lot of alternative materials, not least because of health problems with wood dust, and creates his own specialist tools, by grinding a Allan keys, for example. There was much to admire in John’s deft turning and I’m sure he’s right that “making small things teaches you tool control”. It will be interesting to see how many members follow his highly-skilled example! Do not allow rags in the workshop. Let me rephrase that – do not allow rags near moving parts in the workshop. I have heard of an incident where a rag was caught up in a rotating lathe, and it snatched the whole piece of rag together with the hand, and a finger was lost. Always consider paper kitchen roll or the commercially available polishing cloth that will break off and tear if caught and snatched.